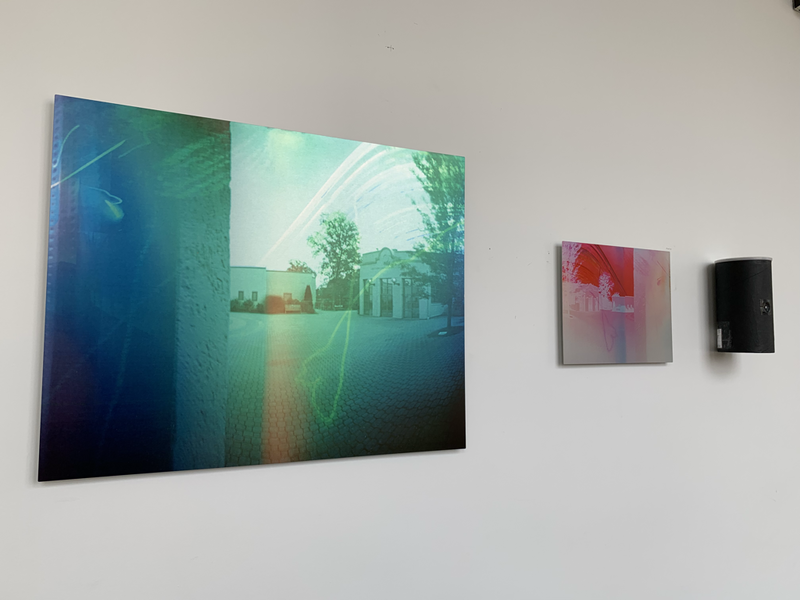 Some of my site specific work, part of my show, 16 Weeks Under the Pines, now on view at the Moira Fitzsimmons Arons Gallery at Hamden Hall Country Day School until March 8. 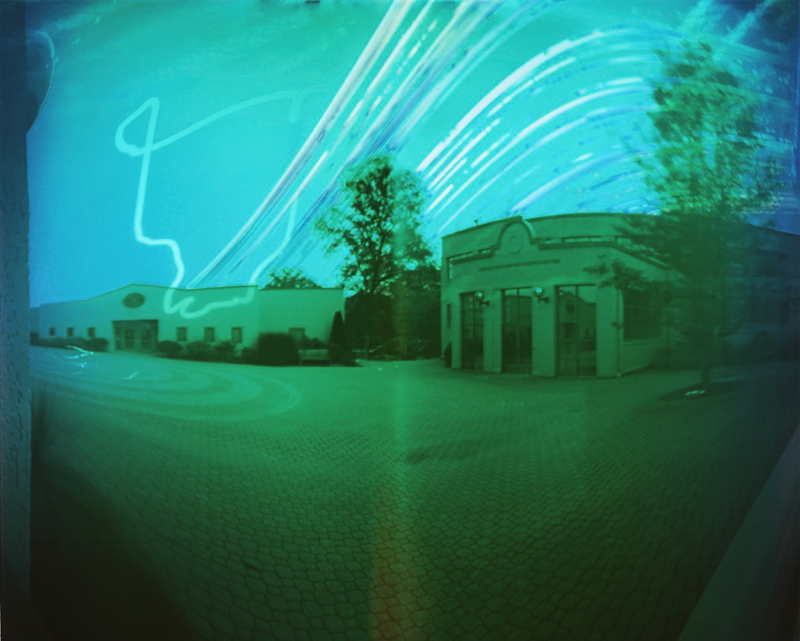 ​Eight years ago, I started working with my handbuilt pinhole cameras and the solargraphy process. Here are some images from the cameras I installed at The New Britain Museum of American Art, overlooking Walnut Hill Park, designed by Frederick Law Olmsted. ​Halfway through the six month exposure, I took out the photopaper and did a progress scan, seen here. 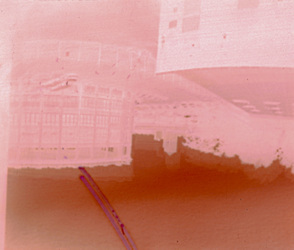 After the scan, I went back to NBMAA and put the negatives back in the cameras to continue exposure. In two of the cameras, however, I accidentally put the paper in upside-down. The result was beyond anything I could have imagined. ​The Library Science Project opens today. I modified the project a few times in the few months since the original proposal. 3-D Installation, detail of 3-D model made using SketchUp. Hanging on the precipice, checking out the installed outdoor pinhole cameras in and around West Rock Ridge Park. I made these cameras out of 1 quart paint cans from the local big box hardware store, painted flat black inside and out. Spray painting aluminum shims a flat black. These shims are about 1 1/2' x 2' pieces of soda cans. If you look closely you can see the pinholes I already drilled into them. These shims will be attached to the cameras using epoxy and tape. The flat black will prevent light reflecting inside the camera. Designing, building, installing handmade pinhole cameras is only part of the process. Finding appropriate locations to install is another component. Working around inclement weather is also part of the mix. All of these are usually behind-the-scenes art-making production phases that are typically left out of the final product. Well, the good news is the photo paper I plan to use for the project is fine. I scanned the paper and saw something, faint, but definitely something. 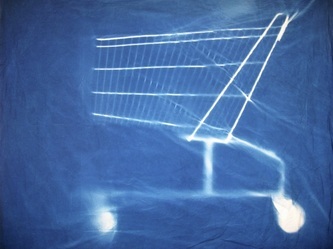 I inverted the image, tweaked the saturation etc. and got a glimpse of something but all I can figure out is there's a window screen and some light. Good enough for me! This two week test was just to make sure the paper could record something. So now, it's on to building the cameras, lining up locations with lots of open space, and getting them out into the field. And no, the snow is not gone. Prototype Pinhole Camera is set up to capture this view. The two-week exposure test ends on Feb. 25. Maybe all the snow will be gone by then? My next project is a multi-camera photography project. Starting on March 20 and running until the end of May, I will have two dozen handmade pinhole cameras out in the field, loaded with black and white photo paper, recording effects of the movement of the sun. The research and legwork I'm doing now is taking some time, but it's necessary. I'm scouting locations to place my handmade pinhole cameras for ten weeks. The ideal locations have open space and an unobstructed view of the path,or part of the path, of the sun over the course of the day. Solargraphy is a type of long exposure photography (months +) that results in a photograph that captured the path of the sun over many months. 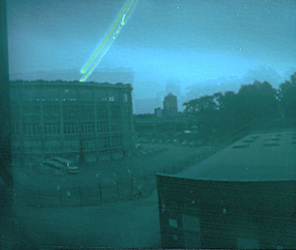 These photos are made with pinhole cameras outfitted with light sensitive photo paper (instead of film). 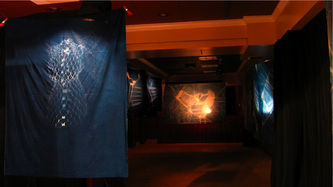 I've displayed part of the Dress form cyanotype photogram series in an installation I did as part of the downtown Hartford CT empty storefront project 2009-2010. Seven pieces (maybe a few more) will be on view at Gallery 46 in Rockville-Vernon, CT starting next week, January 11, running until February 5, 2011. 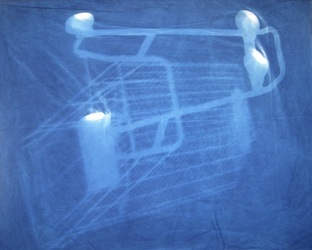 The opening reception is Saturday, January 15, 2011, form 6 - 9pm. Although the storefront project gave me the opportunity to show the work in a different context, and be able to hang it in the middle of the space and backlight them, it also didn't allow for people to enter the building to get near the art work. I'm planning to hang the work off the surface of the gallery walls and currently designing a way to light them from behind. I'm also designing a window installation, to include the metal dress form, and some ethereal lighting. My first time participating in City-Wide Open Studios New Haven was a great experience. I got to meet 100s of people and introduce them to my work. Students from the COOP Arts and Humanities Magnet High School visited in two groups for special private tours on Friday and Tuesday. Here's a 3-D rendering animation I made of my proposed installation for CWOS.org Alternative Space at 200 College Street in New Haven. 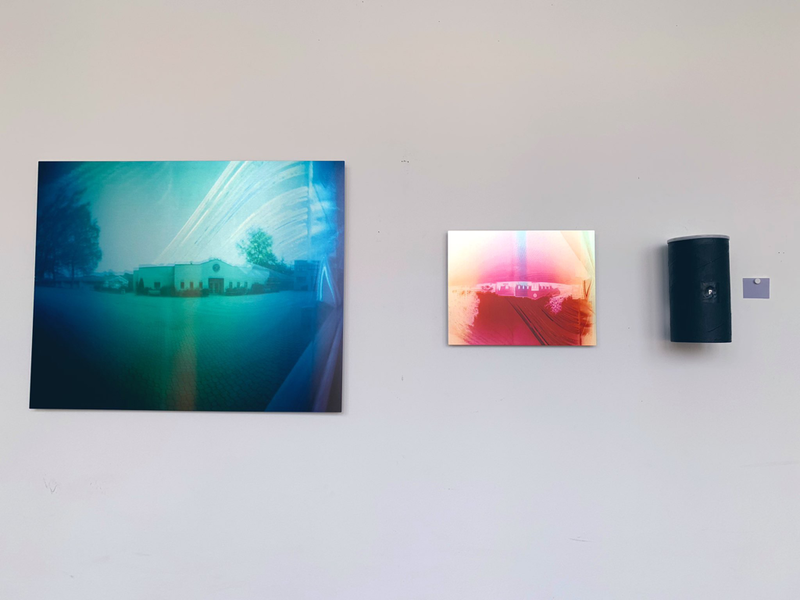 I'm one of 30+ artists in this building transforming a former office / retail building into art spaces for the third and final weekend of Open Studios. The Alternative Space, 196-212 College Street, New Haven CT, is open Saturday and Sunday, October 9 & 10, Noon - 5PM. 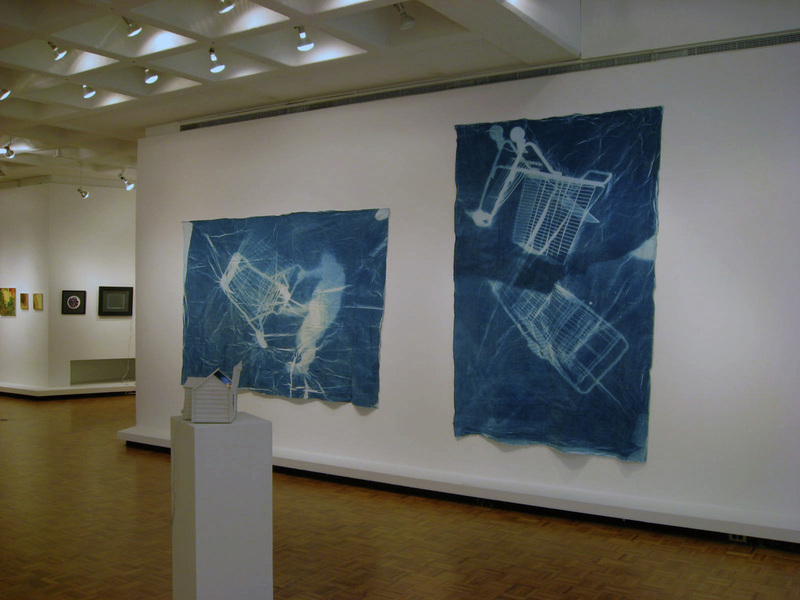 Open Studio kick-off party at Artspace New Haven is Friday, September 24. A new body of work in the making. 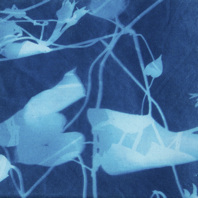 A new batch of small square format cyanotype photograms with botanical content. In my photograms, I try to capture recognizable forms and present them in a new way. 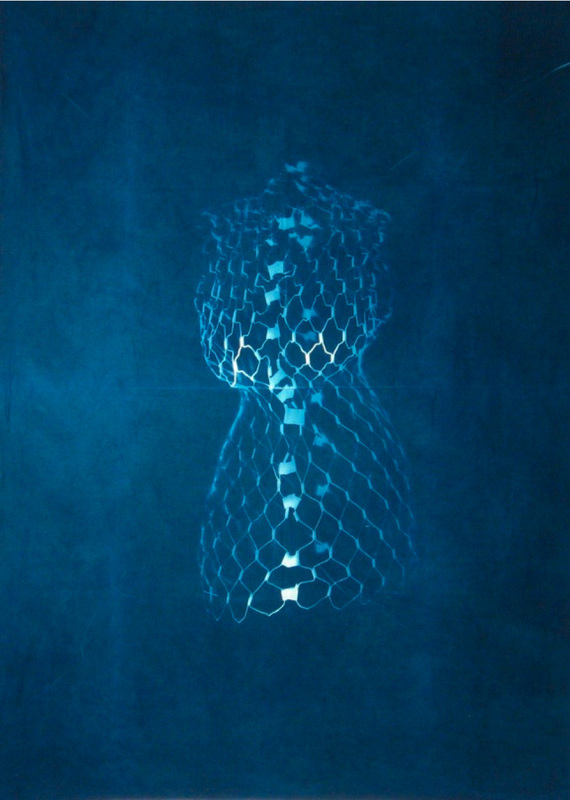 I work without a camera to make the prints, placing objects directly onto the light sensitive surface of my material. After exposing to the sun for approximate 15 minutes, the object is removed and the material is rinsed in water, then air dried. 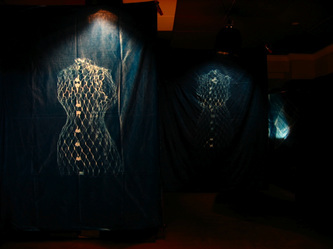 The object's form and shadow forms are revealed. This morning, I made a batch of 30 prints. Conditions weren't optimal, (sunny then cloudy, breezy then gusty), but about half of the prints are fairly decent. Lack of sun due to clouds cut back on the shadow forms. 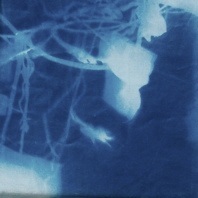 The wind knocked things around during exposure, but helped speed up the drying stage of the process. Yes, they're decorative, but there's more to it than just pretty. The plants I used are Morning Glories culled from a vast tangled bunch I grew from seed. They really started to take off a couple of weeks ago. These are seeds I cultivated from previously planted Morning Glories. The last photographs my dad took were of the Morning Glories on the back deck. He's been gone three years this week and it's still strange, that here but then not here. Liminal space isn't as uncomfortable as it once was. I'm not as concerned about figuring it all out right now. I have come to accept that nothing is the same, but it's OK. I work on my art and then I see something new. I'm learning new things all the time. That's the best part of being an artist.